Fowler positioning comfortably accommodates patients for prolonged periods. Fowler positioning comfortably accommodates patients for prolonged periods. 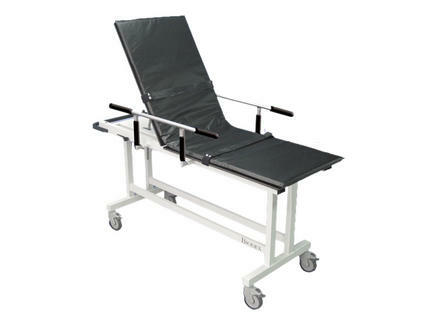 Ideal for patient transport to and within the MRI suite, the MRI Stretcher with Fowler positioning is non-magnetic, all aluminum, and designed for heavy-duty use. Fowler positioning is infinitely adjustable and the stretcher comes complete with mattress, restraining straps and retractable guard rails. Five-inch ball bearing swivel casters provide easy, controlled mobility and lock firmly to secure the stretcher in position as needed. Optional IV Rod mounts in a socket at the head end of the table. Patient Capacity: 500 lb (226.8 kg); weight tested to four times the patient load rating. Compliance: MR Conditional; Tested with Philips Achieva 3T System and tested and approved with Siemens Trio 3T System and the Siemens Verio 3T System.